UK: Nearly half of the total expenditure on the country's offshore wind projects goes to UK companies, a new report reveals. The 48% figure of expenditure in planning, building, and operation of British wind farms going to UK companies is up five percentage points from RenewableUK’s last wind industry investment report two years ago. This means the sector is closer to the government’s target for the sector, set in 2012, of 50% of UK content in offshore projects by 2020. 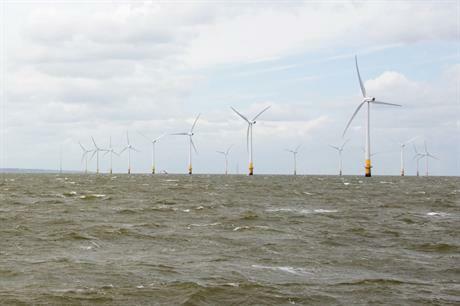 RenewableUK’s report, Offshore Wind Industry Investment in the UK, focussed on contracts worth more than £10 million (€10.9 million) across eight wind farms with a total capacity of 4.6GW that reached a final investment decision (FID) between 2010 and 2015. The trade association’s analysis shows that the 11% growth in Capex (capital expenditure) contracts going to UK companies is the main factor behind a greater proportion of total expenditure remaining in the UK. The development of the UK supply chain companies and inward investment from international businesses had helped this growth, the authors noted. An average of 73% of development contracts were awarded locally — up 16% from 2015. Contracts awarded to international companies using UK offices were not included in this figure, RenewableUK stated. Meanwhile, the number of operational contracts being awarded to UK companies increased 2% in the last two years, analysis shows. In the foreword to the report, Benj Sykes, co-chair of the Offshore Wind Industry Council, which commissioned the report, wrote, "deploying larger components and at greater scales than previously seen" had driven down costs. Sykes is also UK country manager at leading offshore wind developer Dong Energy. Technological innovation, from more efficient and more powerful turbines to the utilisation of drones for maintenance, had also helped bring costs down. "We’re seeing the supply chain for offshore wind grow from strength to strength, delivering innovative new solutions to help reduce costs and making a positive impact on communities right across the countr," Sykes added. The sector is investing £11.5 billion (€12.5 billion) in the UK economy over the next four years, UK minister for energy and industry Richard Harrington said. This figure is greater than the UK's spending on broadband and infrastructure network over the next four years, according to RenewableUK. "This report demonstrates the strength of this growing sector and the positive impact it is having on the UK supply chain," Harrington said.